The fly-trap clearly broke the chain, since it was a plant that could attract, capture, kill and digest insects, which were supposed to be higher on the scale. Like various species of mimosa, the fly-trap also possessed a form of sensation, supposedly only a property of animals. “Of vegetable animation”: “The fibres of the vegetable world, as well as those of the animal, are excitable into a variety of motions by irritations of external objects. This appears . 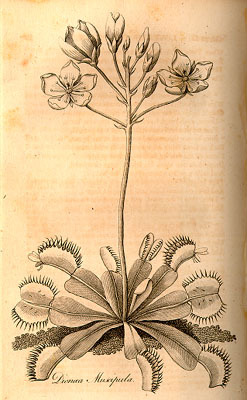 . . [in] the Dionaea muscipula, which was lately brought over from the marshes of America” (Zoonomia, I, 73).